Need more information about booking Home 7302479 ? Featuring elegant decoration in modern color hues, these self-catering apartments offer free WiFi, air conditioning, a flat-screen TV and a fully-equipped kitchen with espresso machines. 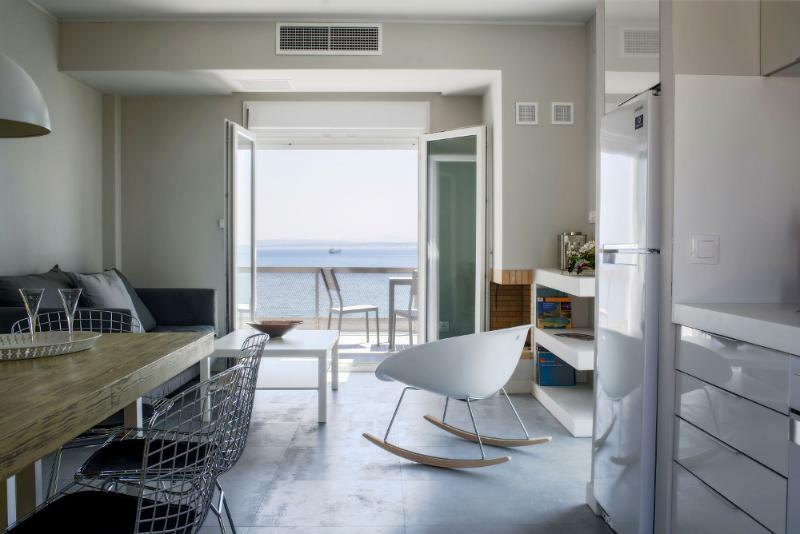 The mattresses, bed-mattresses, pillows, all by COCO-MAT, a recognized leader for natural sleep products All the maisonettes have private balconies enjoying unlimited sea views, overlooking the picturesque fishing village of Kataraktis They include a dining and sitting area. An en suite bathroom with bathroom amenities and natural soaps from MastihaShop with original Chios's mastiha are also provided. Located in Monolia, just above the quite, almost private beach of Ayios Yiannis and 5 minutes' walk from the cosmopolitan beach of Ayia Fotini (Agia Fotia), one of the favorite beaches for the locals with colourful pebbles and deep, crystal water. Cafes, taverns, mini markets can be found in the area. Chios town, the airport and the port are just 10 km away. En route to the city crossing Kambos, an area full of citrus orchards, wells, stone walls and mansions dating back to the Genoese era. From Monolia you can organize many excursions to Notiochora (southern villages) and the most impor¬tant monuments of the island. In Kallimasia village, just 1km from Monolia, you can buy basic necessities but also visit the famous Folklore Museum. The region is full of mastic trees which produce the unique product in the world, the famous mastiha. In monolia maisonettes will enjoy your vacation as if you are in your own summer-house! You can get in touch with Virginia (the owner) through the contact form on this page. Send Virginia (the owner) an email through the contact form on this page. Alternatively, if there’s a phone number on this page, you can call them. How do I contact Virginia (the owner)? If you’ve already booked, go to Manage your holiday booking to view Virginia the owner's contact details or send them a message. Or send Virginia (the owner) an enquiry through the Contact the owner/manager form if you’d like a quote or more info first. When you pay online through the Book your stay form, a booking request is sent to Virginia (the owner). You’ll find out within 24 hours whether they’ve accepted - no money will leave your account before then. You can also request a quote from Virginia (the owner) through the contact form. The owner will email you the total cost for your dates and a link to book and pay online. Use the Book your stay form to pay provisionally online. You can pay by credit/debit card or PayPal. Virginia (the owner) will have 24 hours to accept the booking and no money will leave your account before then. Why can't I call Virginia (the owner) before booking? You’ll need to contact Virginia (the owner) to do this. Send them a message in Manage your holiday booking or through the contact form on this page. You can request to change the dates or number of people on your booking via the Manage your holiday booking page. To change your holiday dates use the Edit booking button. If you need to change the number of guests staying then send Virginia (the owner) a message. If Virginia (the owner) agrees, they’ll send you a revised quote outlining the changes. You can review and accept/decline this from the Manage your holiday booking page. You’ll have 48 hours to take action before the revised quote expires.